Save AED 51 (48.57%) – Earn 5 Shukrans What is Shukran? Shukran is the Landmark Group’s award-winning loyalty programme in the Middle East, which allows you to earn Shukrans when you shop any of our brands. 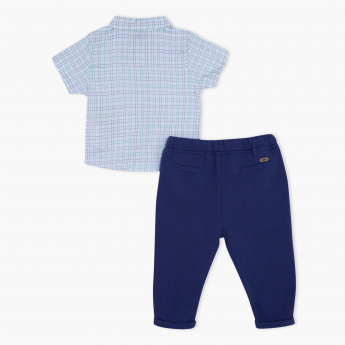 Assuring excellent comfort along with a soft feel, this shirt and pants set is a unique pick for your darling. Featuring a shirt with a print and enhanced with a bow at the collar, the set with its matching pants is quite a grab.